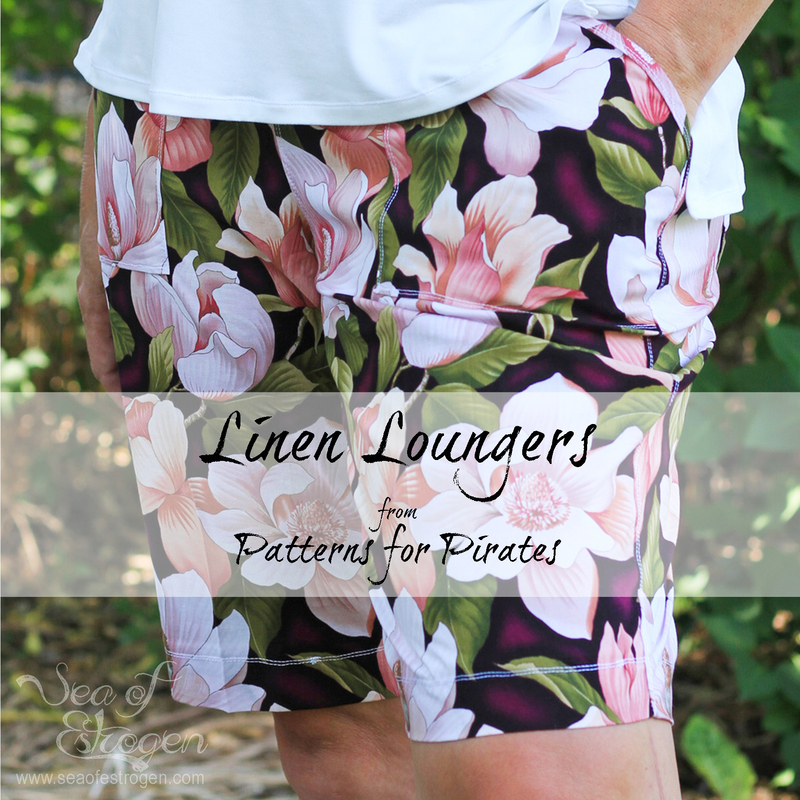 Check out the Patterns for Pirates Linen Loungers! I feel very fortunate to have been included in the pattern test for the brand new ladies pattern from Patterns for Pirates, the P4P Linen Loungers. 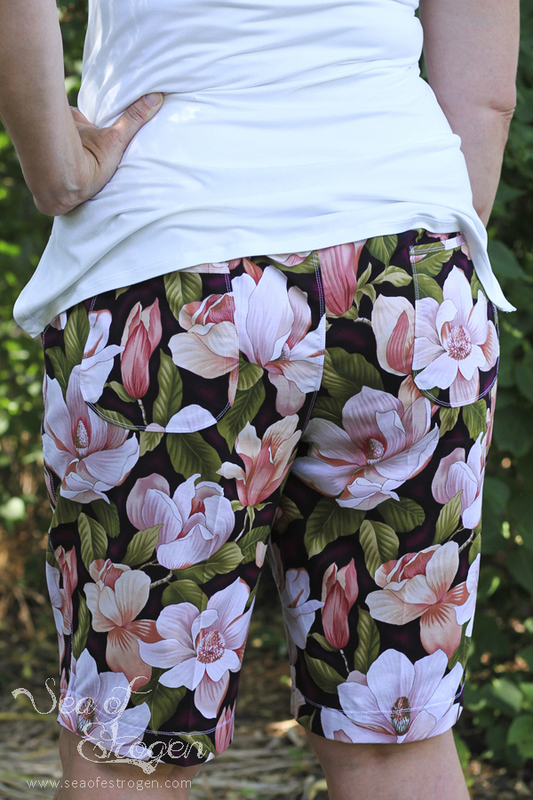 I tested the Bermuda length with yoga waistband and front and back patch pockets. Normally I don’t like wearing shorts this length, and I was hesitant, at first, to cut into “good” fabric for the test. 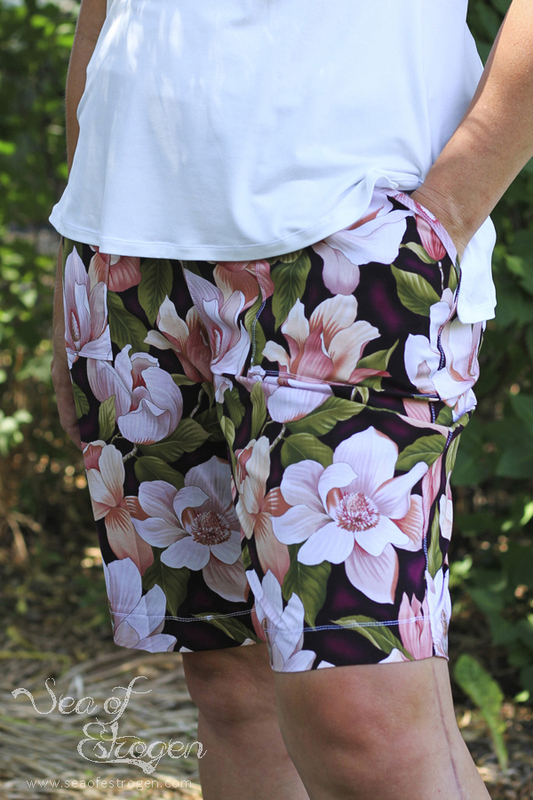 I prefer my shorts about 6″ shorter, but these are absolutely perfect! They are so comfortable it feels like I’m wearing pajama pants when I wear them! The Linen Loungers are fitted at the full hip, semi-fitted through the thigh, and tapered at the knee for a slight bootcut flare on the full length pant. They are a pull-on/no-zip pant. The waistband is a straight shot up from the full hip which adds ease at the high hip where the waistband attaches. The waistband will be snug to your body whether you use the elastic or yoga option. The Linen Loungers are mid-rise – not low on the hip bones or up at the natural waist. The pattern options include full-length pants, capri pants, Bermuda shorts, cuffed shorts, and curved hem shorts. Pocket options include front patch or hidden pockets and a back patch pocket. I made my Bermuda length shorts with both front and back patch pockets. Another nice feature of the Linen Loungers is the different waistband options. The waistband can be made out of woven fabric with an elastic casing. The other option is to make a knit yoga waistband. I chose the yoga waistband option for my pair, and I love the convenience of it. 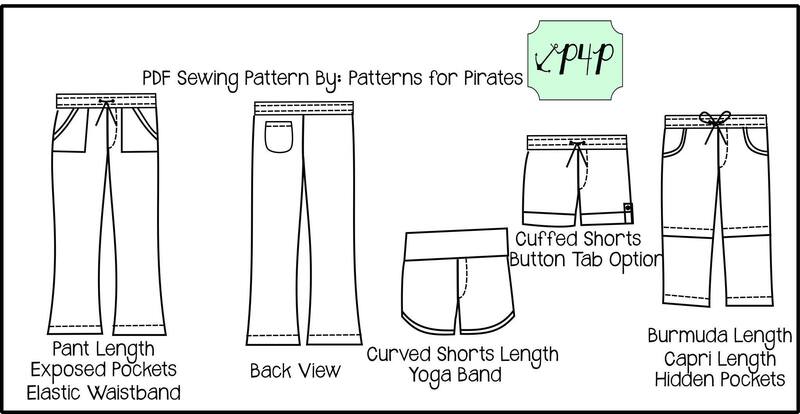 One of the things I like most about Patterns for Pirates PDF patterns is the no-trim pages. The pattern pieces don’t require trimming before assembling. They also have LAYERS options at printing! Download files include US Letter, A4, and Copy Shop Size printing options. For size and option variations, modeled pictures, and more details, visit the round up blog post and Facebook Album full of photos to look through. The P4P Linen Loungers is on sale for a limited time during the pattern release, and, as with most P4P patterns, there is also a matching youth pattern available here: P4P Little Loungers that is on sale, as well. In addition, save even more by purchasing both patterns as a Bundle. Come join the Facebook Group to see more pictures, and share with other Patterns for Pirates fans. In addition, check out this entire Pattern Hack Blog Post, which illustrates different ways to change up the pattern.